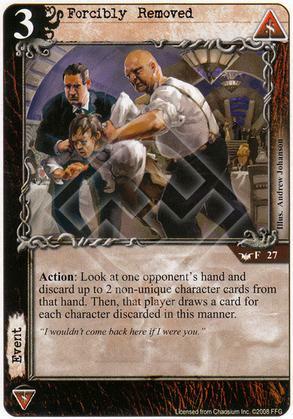 Flavor Text: "I wouldn't come back here if I were you." Definitely too expensive for what it does. The non-unique restriction doesn't really need to be there for a 3-cost event. Expensive events have to have a pretty significant effect on the gamestate, and this doesn't really cut it. Horrible card, gives away card advantage and may make your situation worse. Maybe, just maybe, I'll find a home for a copy in an agency syndicate deck. I think that agency's new cards that permanently reveal your opponent's hand and allow you to recur this may make it useful.